Modernization has not quite spoiled La Digue Island, allowing the region to retain its biodiversity. Takamaka trees, palm-like cycads, pitcher plants nepenthes, wild herbs and shrubs, pineapple plants and banana trees abound. Large granite boulders separate its pink beaches—Anse Severe, Anse Union, and Anse Source d’Argent—from each other. La Digue is Seychelles’ third largest region and is home to about 2,500 residents. It was once the centre of copra production in the nation. Most of its villages can be found on the coastal plateaus, La Passe being the main residential area and the site of the fish market. Only a few residents own cars; most prefer to walk, ride bicycles, or ride in ox-carts, the traditional mode of transport here. The village roads pass by old plantation houses, thick forests, and secluded beaches. The La Veuve Special Reserve protects the endangered Seychelles paradise flycatcher. A large camp of Seychelles giant tortoise also inhabits the island. La Digue is a popular fishing and diving destination. Boats regularly take passengers to and from Mahé and Praslin. The island can also be reached from Mahé by helicopter. At the centre of the island is the Chateau St. Cloud, a vanilla plantation house converted into a hotel. Other lodgings are provided by the equally popular L’Union Chalets, La Digue Island Lodge, and Gregoire’s. 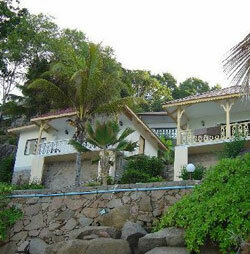 Private homes at L’Union and beachfront properties on Anse Banane are for sale.